Micro and nanorobots that attack tumors with the most precision using drug could be the way to combat cancer in the future. The development of magnetoelectric-controlled Janus machines by a team of ETH researchers, headed by Salvador Pané, has the potential for such advances. While traveling on a trolleybus in Zurich, Salvador Pané conceived an idea when the bus was stopped suddenly due to disruption of the cable. Why can’t we create a microrobot that generates an electric field wirelessly? Based on this idea, the ETH researcher and his collaborators have successfully created tiny particles that are accurately controllable by magnetic fields, and capable of generating electric fields. This is a breakthrough, and the research is unique as the resulting microstructure not only moves with a single source of energy, but also performs another functionality. This had previously only been achieved independently of each other. Pané and his collaborators, from the Institute of Robotics and Intelligent Systems, have reported their work in the Materials Horizons journal. The study results show promise to transform the field of medicine. Pané has been exploring magnetoelectric micro and nanorobots that respond to electromagnetic fields for the past few years. Some of these materials consist of different layers, with each responding to the magnetic field in a different manner. You have to imagine it like a lasagne with two layers: one layer responds to the field by changing its volume. These materials are magnetostrictive. 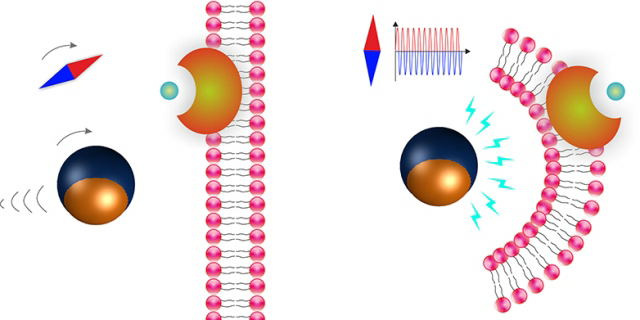 Due to the stress transferred, the second piezoelectric layer becomes electrically polarized. This effect have been positively used by the researchers. The microparticles were coated on one side with two different metal layers: cobalt ferrite (magnetostrictive) and barium titanate (piezoelectric), which are the two lasagna layers. The generation of a magnetic field around the particles expands the inner cobalt ferrite layer and deforms the outer barium titanate layer. As a result, an electric field is produced around the microparticles. Electrochemical reactions were induced to demonstrate the magnetoelectric effect. As the microrobots have two halves, they have been named after the two-headed Roman god, Janus. Rotating magnetic fields enable the Janus particles to move. The change in the magnetic field causes the microrobots to produce an electric field, opening the door for various applications especially in the medical field. We could equip the microrobots with drugs, for example, and target them directly at cancerous tumours in the body, where they would then unload their cargo via the stimulus of the generated electric field. This would virtually eliminate the side-effects of cancer drugs because only the cancer cells would be attacked. In addition, the precise application would significantly increase the efficacy of cancer therapies. However, applications like the wireless electrical stimulation of cells could transform the field of regenerative medicine. More information is required before the actual application of the microrobots for drug delivery. For instance, the most efficient structure of material combination that exhibits the optimum magnetoelectric properties is yet to be known. It is necessary to test the microrobots for their compatibility within the human body. A lot of experiments still need to be done. This is often overlooked at the micro and nanoscale, but it needs to be thoroughly investigated. Corrosion can affect the function and contaminate the device. We have to look very carefully if we want to use a technology for a medical application. Therefore, the research team not only explores technical feasibility, but also the efficiency, toxicity and compatibility of the micro and nanorobots. Pané believes that the microrobots could play a major role in the biomedical field one day. That day would be the end of an expedition that started on a Zurich trolleybus.